Honda CR-V (2018) – Car Review. The new model of the best-selling SUV. It could be said that Honda had things more-or-less their own way when, in 1995, they launched the CR-V. Few manufacturers back then offered such things and buyers were yet to catch-on to the now all-encompassing SUV bug. But, catch-on they did; the CR-V is now the world’s best-selling SUV and every manufacturer you can think of now offers something similar. What a fickle bunch we all are, eh? It’s perhaps not exactly “cool” to say such things, but I’ve always had a bit of a soft-spot for Honda’s big family-orientated soft-roader. And I’m saying that as someone who’s far more likely to carry a bookcase, a bicycle, or indeed anything other than a sprawling brood. I’m also, just, slightly younger than Honda’s stereotypical core audience (despite my white hair). That’s partly because ever since its inception the CR-V has offered near car-like driving manners in a SUV package. 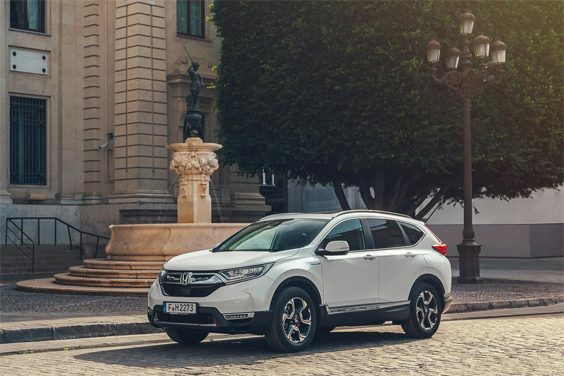 It’s always been very nicely put together, it’s logically laid out and generously equipped inside, and Honda’s reputation of reliability means the CR-V holds its money come trade-in time. It’s a bit of looker too – in that trademark discreet, understated, and somewhat premium way, we’ve grown to expect from Honda. It’s also, as previously hinted at, hugely practical. And even more-so it’s available, albeit optionally, as a seven seater – something that until now has not been seen on the CR-V. The boot is gargantuan, especially so if you choose the drop the one-touch folding seats down – they’re a work of genius, just pull the lever – and so too the rear doors that open to very nearly 90 degrees. Honestly, getting baby seats and / or elderly parents aboard has never been quite so easy. The rear seats in our EX were heated too and there’s also plenty of leg-room back there. Getting people back out again was the problem. Up front things are equally as accommodating. The de-rigueur SUV elevated driving position affords good views of everything fore, if not perhaps aft – there’s a reversing camera option to help with that – and slightly slow to react touchscreen aside, everything you touch switchgear-wise moves with a silky, well-engineered, feeling of precision. So then, where’s the catch? Well, that depends upon where you stand when it comes to your preferred choice of fuel, and indeed, your transmission. You can of course get a petrol-powered CR-V, a four cylinder, turbo-charged 1.5 is in fact the only option, and at the time of writing, a petrol hybrid as just been announced. But, there’s no diesel. 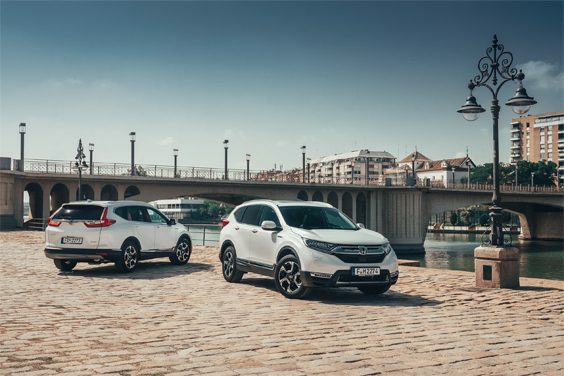 Honda no-longer make an oil-burner CR-V.
Granted, the CR-V is hardly the kind of thing you’d wantonly aim at an apex, but surely even something this sensible should at least offer something in the way of driver enjoyment? 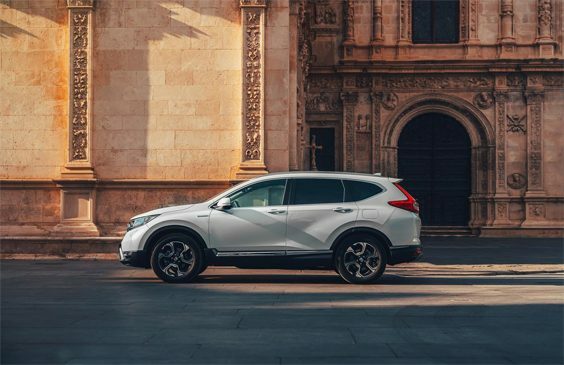 Well, if your enjoyment is derived from simply getting in, selecting drive and cruising along with the minimum of either fuss or effort you’ll love the CR-V when it’s been fitted with the CVT – that’s ‘constant velocity transmission’ incidentally. It’s generally smooth, and quiet, and whereas I did find the ride a bit brittle on some of the surfaces that pass for tarmac out here in the sticks, once out on the more smoothly laid stuff the CR-V settled down rather nicely. In fact, everything’s all rather civilised. It’s just, well, a bit dull. I’ve driven similar-sized SUVs that offer more, involvement, shall we say. Perhaps a manual gearbox would help? Shifting your own gears might also help with fuel consumption. In this guise the CR-V’s a tad thirsty. Honda claim 39.8 mpg combined, I struggled to better 32. CO2 is a high 162g/km as well. Nevertheless, after a week in its company I was rather sorry to see the CR-V go. It feels sophisticated, it’ll carry everything you’ll ever need (and possibly more), and it offers a genuine alternative to anything built in Bavaria. It’s pricey but it feels premium; pick your spec carefully. Quite whether now the CR-V will remain a best seller now there’s no diesel option remains to be seen, but as always, it still would make a very welcome addition to many-a-family’s driveway. Transmission: Constantly Variable Transmission (CVT) with part-time all-wheel drive.